Made with Driscoll’s strawberries, this traditional German strawberry shortcake is a simple, delicious treat your entire family can enjoy! Living in Europe, I’ve had the opportunity to try desserts from so many different countries. Here in Germany, one dessert that can be found during the Spring and Summer at every bakery and restaurant is Erdbeerkuchen mit Sahne, which translated means strawberry cake with cream or as it’s called in the USA, strawberry shortcake! When Driscoll’s Berries asked me to develop a recipe for National Strawberry Shortcake Day, I knew exactly what I needed to make! I’ve taken a traditional recipe for Erdbeerkuchen mit Sahne and turned it into a Strawberry Shortcake recipe that can be easily recreated in the United States with familiar ingredients. 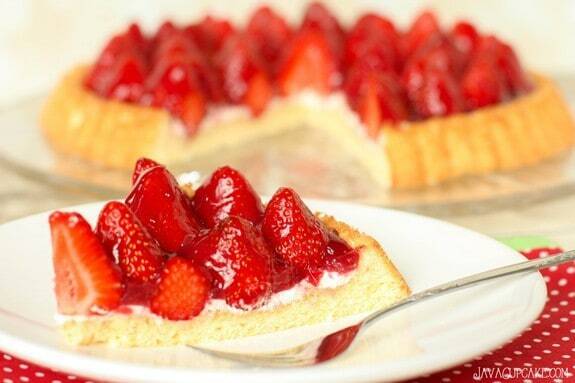 The star of this shortcake is obviously the strawberries. I used Driscoll’s strawberries because I’ve been using their strawberries my entire life. Even better, their strawberries are always ripe, red and delicious and I can buy them at the local grocery stores here in Germany! Driscoll’s has been the strawberry in everyone’s shortcake for more than 100 years! The base of this German shortcake is a light, airy cake made with pastry flour, corn flour, eggs and a touch of sugar. 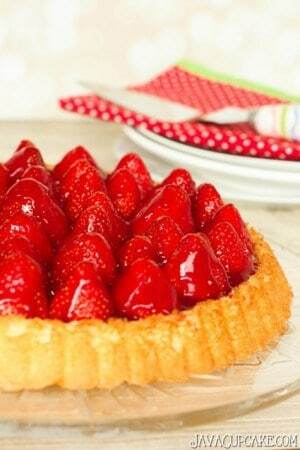 It’s not too sweet and makes the perfect base for the cream and Driscoll’s strawberries. 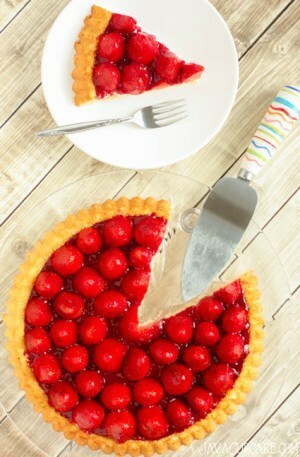 In Germany, the finest ground flour, Type 405 is used for these types of tarts and cakes. It has the highest starch content which makes it ideal for the baking of cupcakes and cakes where you want a finer crumb, the American equivalent being Pastry Flour. For more on the types of flour used in Germany, my friend Ewa of Das Cupcake in Frankfurt, Germany has written a great post about differences between German and American flours! Check it out for more info! Corn flour is also used in this recipe, which gives the cake the golden color and adds a touch of flavor. Not to be confused with corn starch, corn flour is yellow in color and can be substituted with finely ground corn meal if you can’t find corn flour in your grocery store. The cream layer is the easiest part of this shortcake with only two ingredients, heavy cream and sugar. For this recipe, I used a thick, creamy German high-fat cream that is made with cream from the Alps. It’s one of the most delicious creams I’ve ever had and the flavor is truly out of this world. In the USA, you’ll want to use heavy whipping cream which is easily found in the dairy section of your local grocery store. The glaze might be a little harder to recreate as easily in the United States. I did a bit of research online and found that the brand Dr. Oetker makes the red & clear glaze packets in the USA and can be found at stores like Walmart and Wegmans. If you can’t find the glaze packets, I also found several recipes online using powdered gelatin or gelatin sheets to make a glaze. The pan I used is a traditional fruit cake pan called a Tortenboden that I bought at a local German store. It has fluted edges and the bottom is indented to create an edge around the outside when you flip it over. If you can’t find a Tortenboden in the USA, I’d suggest using a springform pan to bake the shortcake in. With the ring still on the pan, let the cake cool completely then spread a thin layer of whipped cream across the top of the cake. Arrange the strawberries on top of the whipped cream. Spoon the glaze over the strawberries then allow the glaze to completely set at least an hour before removing the ring around the pan. A note about the measurements for this recipe: European bakers always measure their ingredients by weight and volume. They never use cups for measuring because it’s typically inaccurate. To make this recipe, you’ll need a digital food scale. These scales can easily be found in any Target or Walmart type store for less than $30. Once I got my scale, I began measuring all my ingredients by weight and found my recipes came out better than ever. I included both Imperial/US and Metric/Europe measurements when either would work in the recipe. And as a special treat to my readers, Driscoll’s has provided $100 in Driscoll’s coupons to one lucky person! Participants must be 18+ years old and live in the USA to win. To enter, fill out the form at the bottom of this post! Paid Endorsement from Driscoll’s – Visit www.driscolls.com for more berry recipes and to enter their summer sweepstakes. Preheat oven to 180 Celsius degrees (350F degrees). Generously grease the Torte pan with butter making sure to cover the entire surface. In a medium bowl, whip the egg yolks, granulated sugar and hot water together with a hand mixer until they are pale yellow and fluffy. In another medium bowl, whisk together the 405/pastry flour and the corn flour. In the bowl of your stand mixer, whip the egg whites and salt until firm. Once the egg whites are firm, slowly pour in the egg yolks and add the flours. GENTLY fold the mixture together until just combined. Make sure to scrape the bottom of the bowl to incorporate everything. Use a gentle fold and be careful not to deflate the batter. Gently spread the batter evenly into the prepared Torte pan. Bake for 15-16 minutes or until golden brown. Allow to cool in the pan completely. Once cool, invert the Torte and place it on a serving plate/dish/stand. The indented side of the Torte should be up. In the bowl of your stand mixer fitted with the whisk attachment, whip the cream on high speed until it becomes frothy/bubbly. While the mixer is still whipping, slowly add the granulated sugar. Continue to whip on high speed until stiff peaks form. Spread a thin, even layer of the whipped cream across the indented portion of the Torte making sure to leave the edges of the cake free of cream. 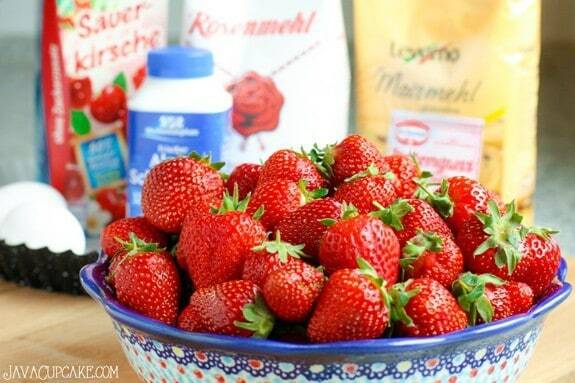 Rinse and dry the strawberries. Cut the top off of each strawberry creating a flat edge. 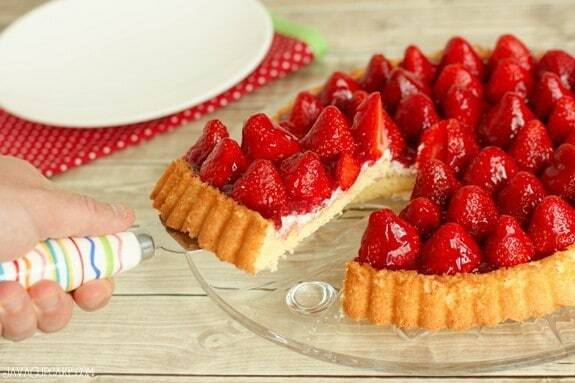 Beginning on the outside edge and working your way to the center, arrange the strawberries cut side down, on top of the cream on the Torte. In a small sauce pan, whisk together the cherry juice, powdered gelatin and granulated sugar over medium high heat. Cook until the glaze just barely begins to bubble. Remove the glaze from the heat and let stand for about 30 seconds. Working quickly, use a pastry brush, brush a thin layer of glaze over the berries. Drizzle the glaze between each berry to cover all of the cream. Be careful not to get any glaze alone the outer edge of the shortcake. NOTE: If the glaze begins to become clumpy, it has become to cool. Reheat it over high heat until just bubbling and continue to drizzle. Allow the glaze to set at least 30 minutes before serving. This cake is best served within the first day. Cut into slices and serve with coffee or tea. Wow that is one unique dessert! Looks delicious though. From the website I would like to try the strawberry and goat cheese bruschetta. You’re right, this is definitely a dessert that most Americans have never seen before! But, here in Germany, they’re found in every bakery and made in every kitchen! SO YUM! Angel Food Strawberry Shortcake! I lived in W Germany when I was little and my dad was in the Army. My makes the most awesome cheesecake from there. Some day I will add it to my blog! Your dessert looks lovely and I’d love to try it. If I were to choose a recipe from Driscoll’s it would be the Strawberry Shortcake with Orange whipped cream. That flavor combo is great. This looks Fantastic! I rented from a German woman for almost ten years and she had one of those pans and made fruit tarts all the time in the summer and topped them with little packets of powdered glaze she would bring home every time she went to Germany. She would always bring the best treats back with her, Dominoes (the lttle chocolate coated raspberry and marzipan squares) marzipan “potatoes”, chocolate lebkuchen.. Mmmm. Oh that’s great, Ashley! Did you ever get to enjoy in her fruit tarts? I absolutely LOVE them this time of year! So simple, yet SO GOOD! That strawberry shortcake cheesecake calls to me! I would love to make the Strawberry Shortcake Skillet Cobbler. I love using my cast iron skillets, and I may have a slight addiction to Cool Whip! Salted Caramel Chocolate Strawberry Shortcake in a Jar. Looks amazing! Cornmeal strawberry shortcake with lemon curd whipped cream. Yummy sounding. Betsy!! This is GORGEOUS! Those strawberries just pop on top. And you’ve reminded me of a german dessert I want to make for my dad for father’s day. #win! Strawberry Shortcake S’Mores is calling my name. it looks like the perfect summer dessert! i’d like to try the strawberries with whipped mascarpone cream. it seems simple yet flavorful. Girl, this is one amazing looking dessert! I love how vibrant the berries are on top! I’d like to try the Cornmeal Strawberry Shortcake with Lemon Curd Whipped Cream. Your dessert looks delicious, too–thanks for sharing. The cheesecake recipe looks divine. This is just screaming Summer to me! What a beautiful treat! 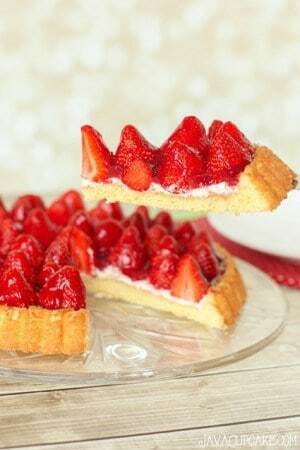 What a gorgeous way to serve strawberry shortcake!! The strawberry short cakes with the lemon zest….and of course your recipe. I like the cheesecake recipes. The Gluten-Free Raspberry no bake cheese cake looks great and easy to make. I can adapt it to strawberries too. But then the Strawberry Shortcake Cheesecake is looking pretty good too. I’d Love to try the Salted Caramel Chocolate Strawberry Shortcake in a Jar recipe. I’ve been on a Salted Caramel Kick and this recipe looks easy and delicious! I think your recipe looks Amazingly Delicious! Thanks for the chance! This looks glorious, and I must make it. 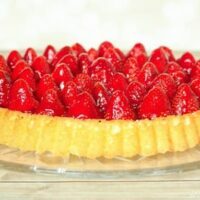 I’ve been looking for a new strawberry tart or pie to try. I think this may be the one. I checked out Driscoll’s web site and I want to try Blossom Strawberry Shortcake Cupcakes. 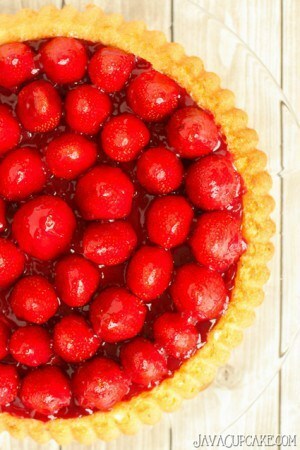 Looks like the perfect July 4th dessert! Vegan Strawberry Shortcake with Coconut Whipped Cream is the first recipe I would try, looks delish and I love coconut and strawberries. the chocolate covered strawberries look really good. 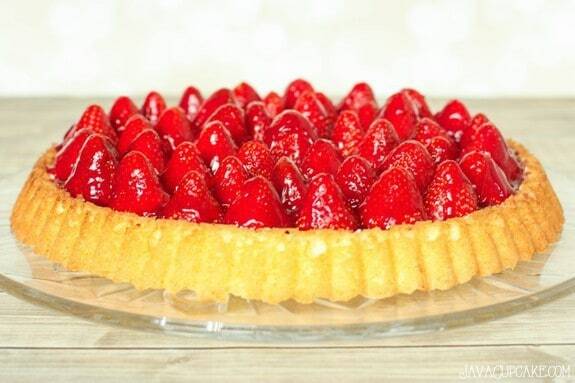 The Strawberry Graham Cracker Tart looks amazing! I usually make good old-fashioned strawberry shortcake, which is always a big hit in our house. But I’d love to change things up by making the Strawberry Shortcake Skillet Cobbler from Driscoll’s website. I can’t wait to try the Blossom Strawberry Shortcake Cupcakes – so cute! I think that’ll be the centerpiece for our Fourth of July party! I’ve been searching for a recipe for erdbeerkuchen mit slag for ages! So glad I found your post. The recipe reminds me of my student days in Regensburg! I tried making the base, as far as I can tell I followed the recipe exactly. However the cake base turned out super thin and chewy. Not at all as it should. Maybe it’s missing baking powder from the recipe…? I still used the whipping cream and glaze instructions after getting a recipe for the base from somewhere else.